DU VAL, P. - Zanguebar. Zanguebar. 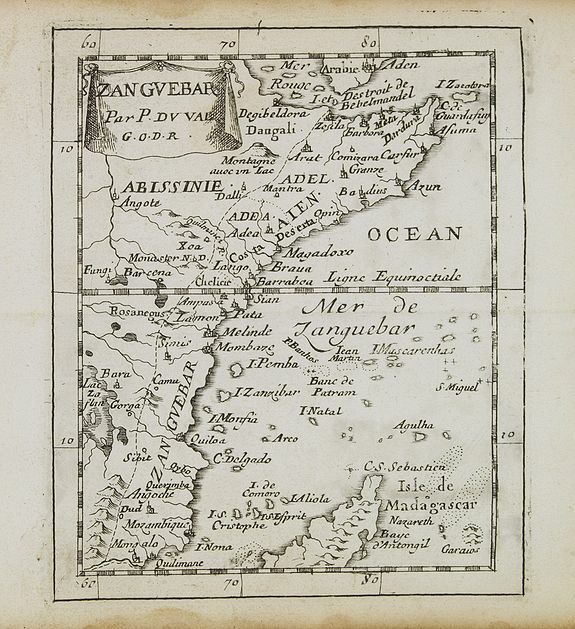 - DU VAL, P.
Description :Uncommon miniature map of East Africa including Northern tip of Madagascar, from Pierre Duval's La Geographie Universeille. Following his Cartes de geographie in 1657, Pierre Duval published this smaller size atlas which contains a larger quantity of maps. The maps in the atlas appear to be derived from those of his uncle Nicolas Sanson. Condition : Paper slightly age-toned. Some marginal water staining in margins and around engraved left and right borders. Very good and dark impression.